A new Tomorrow News Network story comes out tomorrow, and this one’s set on Mars. To prepare for writing this story, I had to make a quick trip to Mars to familiarize myself with the place, and thanks to Google Earth that is possible. For those of you who already have Google Earth on your computers, you know how cool it is. For those of you who don’t have it, click here. It’s free, and it’s awesome. Not only do you get a complete map of Earth, but also Mars, the Moon, and the constellations. 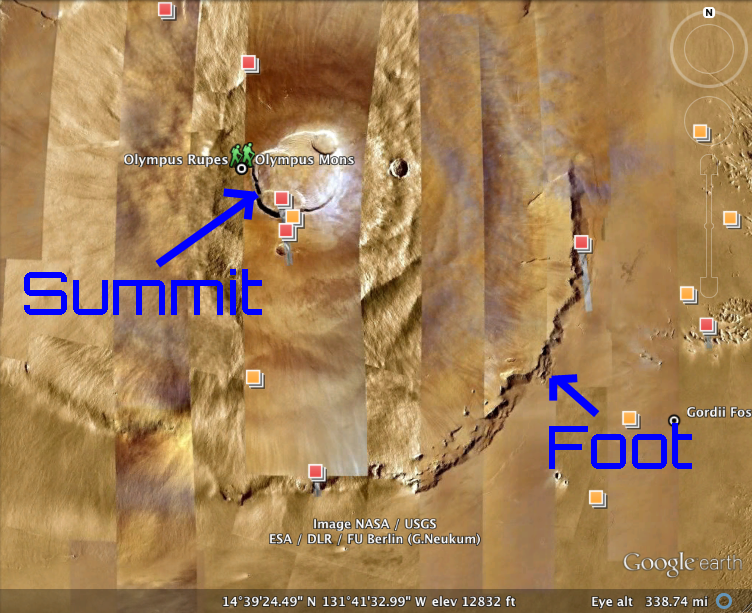 Furthermore, using topographical information, Google Earth can create virtual simulations of Terran, Martian, or Lunar landscapes. Most of this month’s Tomorrow News Network is set in a colony near Olympus Mons, the largest mountain on Mars. In fact, it’s the largest mountain in the Solar System. So my first stop was the summit of the mountain. Olympus Mons is actually a volcano. What you see here is part of the crater. Next I went to the foot of the mountain. 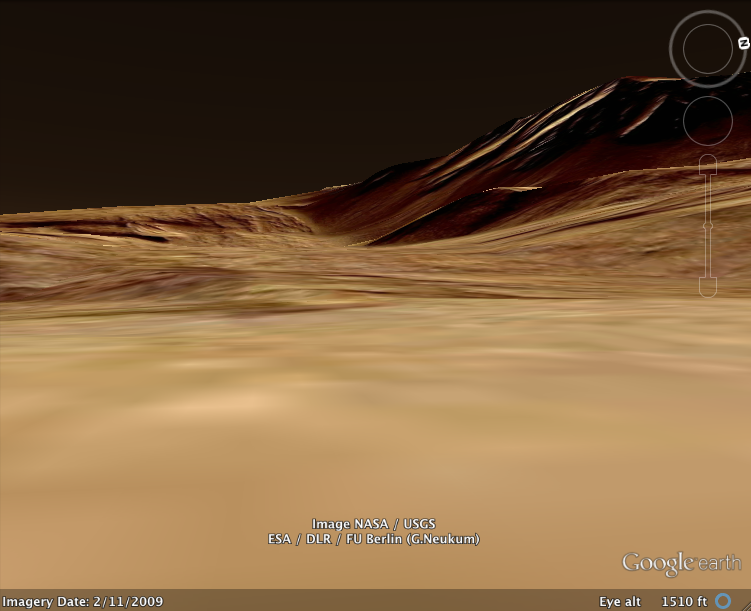 It’s hard to see just how huge Olympus Mons is in these screenshots. The mountain is so big it wraps around the curvature of the planet, so from the bottom you can’t see the top because the top is beyond your horizon line. This is a steep slope near the foot of the mountain. The rest of the mountain is too big to see from ground level. I don’t spend a lot of time talking about Olympus Mons in the story coming out tomorrow. We have too many other things to talk about, but as a writer I like to know as much as possible about the places I write about. Google Earth is a surprisingly good way to do that. I used it to explore Roswell Army Air Field for another story (much of the original base is still there and still in use), and now I’ve used it to explore Mars. So thank you, Google. You guys have made one science fiction writer’s job a little bit easier. All images in this post are © 2012 Google. Posted by J.S. 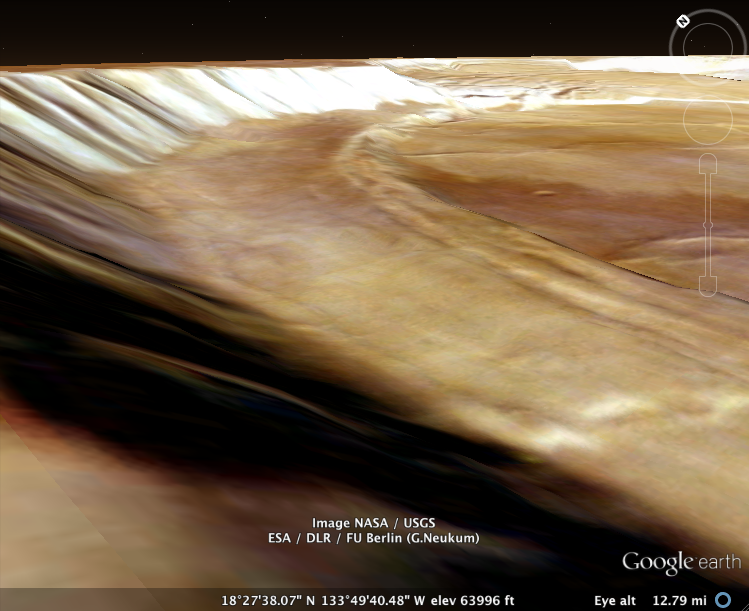 Pailly on June 14, 2012 in Tomorrow News Network and tagged Google Earth, Google Mars, Olympus Mons. Really awesome. I’ll have to go take that tour of Mars. It’s definitely worth doing. Don’t forget they’ve also got the Moon.